An Old file photo of 1950s , Hakeem Ahmad Usmani & Hammad Sb. This post is dedicated to the Men of Morals & medicine who originated from Kudapur -Pargana Chail in Allahabad and left an everlasting mark of their work in the field of Unani Medicine with their aim to serve the human race. 200 years ago when Subah of Allahabad was under the Nawab of Lucknow , a Barat (Marriage Procession) was passing through Kudapur and it was the month of May or June , the sun was fiery and the Baratis were finding it difficult to bear with the blazing heat. There was no well or water-body around. The Baratis were weary , tired and badly needed help. At this time a gentlemen from the Zamindars of Kudapur noticed the Barat and realized their problem. He asked the baratis to make a halt at his house , entertained them in the large hall of his house with the Sharbat made of homemade sugar (Khandsari), arranged cots for the Baratis to rest and allowed them to go ahead only when the “Hammering Sun” had withered a bit. After a week or so, a summon was served in Kudapur asking the same Gentleman to be present at the Court of Nawab of Awadh at Lucknow. Perplexed and confounded, he did not know what crime he had committed that he had been called at the Court at Lucknow. Grudgingly he went to Lucknow and was surprised to find that the Barat he entertained some time ago was of the son of Noble at the Awadh Court and the noble had recommended to the Nawab about the hospitality of the gentleman at Kudapur. Eventually he was awarded with clothes & medals and was given lands over and above his zamindari as a reward. This gentleman was the patriarch whose descendants are the Usmani Hakims of Allahabad. Today we shall read about the family and its members in detail. The Zamindars of Saiyid Sarawan were the ardent supporters of Maulvi Liyaqat Ali of Mahgaon. They were his biggest supporters in 1857 and consequently were one of the biggest losers in the aftermath. One of the grandparents of Hakeem Badruddin of Kudapur also took part in the struggle but was arrested and hanged on the Imli Tree which fell down in 1945. This tree was located near Khuldabad Lohati where a water tank was made for the animals in the memory of Queen Victoria. The dead body of the brave man hung for weeks and fell down only when it got decomposed. During the same chaos, a young British boy who was the son of an revenue official lost his family in Allahabad and was found wandering near Chail when Hakim Ghulam Makhdoom of Kudapur noticed him and brought him to Kudapur. This Hakim Sahib had no issue of him so he loved the boy and looked after him like his child and used to sleep with him like his son. The young child had the problem of epileptic fits. After some time when the uprising subsided, the boy was searched and reward was announced for his recovery by the British, Hakim Sahib thought of going to City to hand over the child but as fearful of the revengeful acts by the British, therefore he sent the boy along with one of his servants. This servant took the English boy and no sooner did he reach Daniyalpur (a village near Saiyid Sarawan), the boy got fits and the poor ignorant servant thought that the boy is feigning and playing an act, he slapped him twice and the poor boy wept bitterly. Afterwards they continued their journey walking till Manauri and from there they took a bullock cart. When they reached the Court in Allahabad. The boy related the entire story but at the end he did not forget to tell the court that the man who brought him here had slapped him twice .The Officer was furious and he issued arrest-warrant for Hakim Ghulam Makhdoom on the plea that whey he had not personally come to hand over the child + Why he was slapped by the “wretched “ slave ? Hakim Sahib appeared at the court and gave his answers but the court was not satisfied and ordered to attach all his property but at the continued insistence of the young child that Hakim Sahib was very kind to him only 24 bighas of land was left for the sustenance of his family. After this seizure (Zabti), the entire family came under severe financial crisis and all the male members were unable to decide what to do since they were ancestral zamindars, they did not know any skill or any craft which they could take up as a job. Only Hakim Badruddin from the family had some formal education so he got a job at the office of Octroi located at the old Kanpur road. Hakim Badruddin had two sons, Munshi Hamid Husain & Ahmad Husain. This Ahmad Husain rose on to the become one of the pioneers of Unani Hikmat in India and his family & descendents followed his path so successfully that the Usmani Khandan of Allahabad is today known throughout the Unani world for his services and sacrifices for the practice. In 1859 when the Allahabad-Kanpur railway line was about to be declared open, a child was born to Hakeem Badruddin who proved himself to be a child prodigy and finished his formal religious education by 19 and under severely unfavourable circumstances , he studied medicine, literature, history,fathered a family and founded a school that in the later years became a Leading Name in the history of Unani Medicine and his family had the distinction of carrying, uninterruptedly the cherished healing tradition of Unani System medicine for more than a century. I am talking about Allama Hakim Ahmad Husain Allahabadi and his descendents, the Usmani Hakims of Allahabad. Allama Hakeem Ahmad Husain, the patriarch of the Usmani Hakeem of Allahabad was born around 1859 in Saiyid Sarawan. Ahmad Husain was son of Hakim Badruddin of Saiyid Sarawan (later on Kundapur) initially he studied at Madarsa Arabia Islamia at Allahabad managed by Maulana Hakim Sufi Ahmad Husain Farooqi Allahabadi but Sufi Ahmad Husain at that time used to travel a lot and thus finding it difficult to finish his studies here , Ahmad Husain decided to leave Allahabad and pursue studies out of the town . Hence he left his house in just one pair of clothes on body and went to Kanpur to acquire the traditional religious sciences at the feet of Maulana Ahmad Hasan Kanpuri. After completion in Kanpur he went to lucknow to learn Hikmat and tried to enroll himself under the tutelage of Tabib-i-Shahi Hakeem Haidar Hasan but Hakeem Sahib, owing to the young age of Ahmad Husain, refused to accept him as a student But Ahmad Husain was determined and did not lose hope. He used to sit outside the room where hakeem Haidar would teach his students. When Hakeem Haidar taught his students, Ahmad Husain made notes sitting outside the room memorized his points. As for lodging, he lived in a mosque or another as he had no money at that time and no relative to visit. He would go to the River Gomti for a bath. Wearing a Kurta, he washed his loin-cloth (lungi) and when it dried he wore the lungi ,then he washed his kurta. He managed his food through a great difficulty by taking help of the offerings in the Masjid and made his roti on the lamps in the mosque. One day when Hakim Haidar Hasan asked a difficult question, none of his students could answer the one. Suddenly Ahmad Husain Sb came out from the sides of the door and asked permission to answer. Amazed at his appearance Hakim Sahib allowed, he gave the correct answer and won the heart of Hakim Haidar Hasan. He instantly took him under his tutelage and started teaching him with great love and care. Upon completion (Faraghat), Hakim Ahmad Husain started practice at Lucknow but upon the advice of elders, he left Lucknow and went to Calcutta. Here he opened his Matab at Zakariya Street, near the Nakhuda Majid and his proficiency earned him money & fame. By now he was getting nostalgic and missed his parents in Saiyid Sarawan. Finally after a gap of 9 years, when he came to meet his parents in Saiyid Sarawan (Which by then had become Kudapur). His parents & other relatives refused to recognize him.They thought that some imposter is trying to dupe them by feigning to be their “dead” Ahmad Husain. When he explained to him the entire map of the old Makan in Saiyid Sarawan with details of boundaries and kitchen and when the family got satisfied after interrogating other details form him only then he was called inside the house and he could meet his mother ,that must have been an emotional reunion of mother & son indeed. Hereafter he opened his clinic in City of Allahabad and started his full fledged practice here. 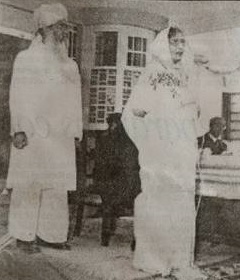 Allama Hakeem Ahmad Husain Usmani was married firstly in PeepalGaon (village in Chail). He had one daughter out of this wedlock but both the mother & daughter expired one after another. ‘Tibb’ means medicine in Arabic while ‘Unani’ means Greek (from Greece) hence Unani Tibb refers to the treatment system that originated in Greece but was further developed by the Arab & Persian doctors. Tibb-i-Unani is based on the Greek concept of humours in which the mixture of humours contributes to an individual’s temperament. The hakim, or doctor, keeps the individual’s temperament balanced harmoniously with the environment & advises changes in lifestyle, diet and exercise. It shares materia medica ideas with Ayurveda. Unani practitioners not only cured bodily diseases but also acted as an ethical instructor. The Muslim occupation in the sub-continent brought this system in India.The Kings at Delhi were great patrons of Unani system of medicine. Many eminent physicians from Persia and Central Asia came to India to find a safe haven from the wars and strife devastating their homelands. The first Unani physician (Hakim) who came to India was from Afghanistan (Herat). His name was Hakim Ziyauddin Abul Rafey Hirwi’ who sought service at the Court of Khusrau Malik, the Ghaznawi ruler, at Lahore in (1160-1186) CE. The Tibb flourished under the patronage of Sultans of Delhi and later by the Mughal Rulers and then by the provincial Nawabs and feudal lords of their times. However under British rule, all forms of healing except conventional allopathic medicine were discouraged. But Unani Medicine survived, mainly due to its popularity with the masses, and the safe, gentle yet effective nature of its treatments. 3. 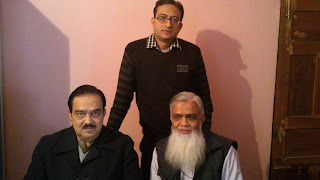 Usmani Family of Allahabad_ Hakeem Ahmad Husain. Today we shall take a look at the origin and evolution of the Usmani Hukama in Allahabad. Here are few excerpts from books that acknowledge the contribution of Allama Hakeem Ahmad Husain. 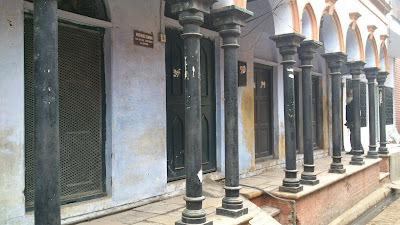 In 1904 when he opened this school it was named as “Al Kullyat ul Tibbiyah’ ( Madarsa Tibbiyah )and started it at a very small scale at his residence in Mohalla Sabzi Mandi Allahabad. When the no of students increased and it required a larger space, the School was shifted to Dariabad and it kept doing well there for many years. In these early years, his fellow Hakims who worked along with him were Hakeem Shifa-ul-Samad, Hakeem Qambar Ali, Hakeem Khaleeluddin etc by his side. In 1914 this school was shifted to a rented apartment in Sabzi Mandi. In 1927, a recognition committee headed by Justice Gokaran Nath Misra on behalf of Govt of India recommended its affiliation with the Indian Board of Medicine UP. Therefore the school was registered as “Unani Medical School, Allahabad “with Indian Board for Medicine , United Provinces. In 1931 , Hakim Sahib shifted the school to a rented bigger place in Himmat Ganj and handed over the management of the school to a society. Thereafter on 30 Sept, 1931, a large orchard was purchased and the entire amount was paid by Hakeem Sahib from his pocket and thus Unani Medical School got his own building and premises thereon. 1931 - A land was purchased by Allama Hakim Ahmad Husain , the founder of the college @ 8000 and in 1932 –Construction started and three rooms were raised. Bait ul Iqan – 1935 - Bait ul Tabie’yan – 1939 – a new building (Dissection Hall) was added by the two brothers from their own pocket which was named as Bait ul Tabiyan after the memory of their mother who died in 1938. In 1942, Hon’ble Sir Syed Wazeer Hasan and Mr. Philips , Chairman , Board of Indian Medicine paid a visit and inspected the entire system of the school and based on their observations , the school was recognized as Unani Medical College, Allahabad. 1942 – Bait ul Safwan – was constructed for Physiology and pathology laboratories after the name of Hakeem Safwan Usmani. 1950 – Hakeem Ahmad Husain Republic Day Memorial Hospital – For practical training of the students and further research purposes, the need of a hospital was feld badly. 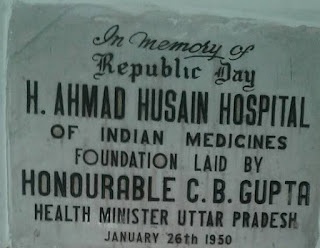 Again the two brothers took the first step and got a draft made for the collage with 200 beds and estimated about 10 Lakhs in 1949.Finally the foundation stone of the hospital was laid by the minister , dep’t of health, UP , Mr. Chandrabhan Gupta on 26 Jan 1950 which was the first republic day of the independent nation additionally Mr. CB Gupta contributed 20,000 on behalf of the govt of UP for the hospital. 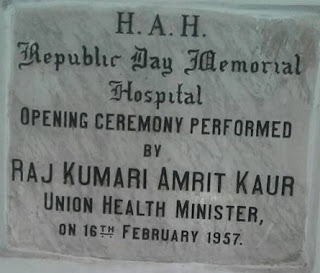 16 Feb 1957, Rajkumari Amrit Kaur MInister of Health, Central Govt.paid a visit to the Hospital on the occasion of Golden jubilee of the College. 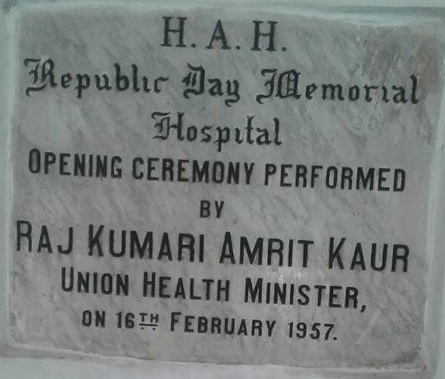 The first floor and the new ward of this hospital was inaugurated by Prabhu Narain Singh, minister of Health , UP on 31 Oct 1976. This must be noted that till then the entire hospital & College was being run by the Usmani family on their own. Besides that these two brothers bore the entire expenses for the hostel, expansions , purchase of further lands etc as well……. 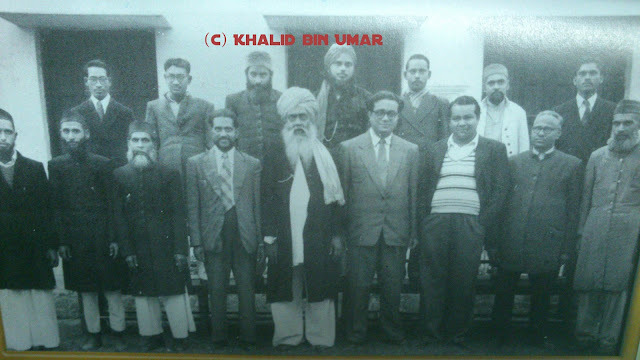 Hakeem Abdul Salam (Manikpur), Hakim Abdul Jabbar Khan (Sahasram), Hakeem ZHakeem Abdul Haleem( Makkah), Hakeem Shamshad Ali Khan(South Africa), Hakeem Kabeer Ali Khan, Hakeem Zubair Ali Khan ( Rangoon),Hakeem Ghulam Hasnain, Hakeem Ghulam Murtuza. Even in these humble beginnings, the goals of Allama Hakim Ahmad Husain were lofty; easing the suffering of the sick with healing herbs. Perhaps the strain of long hours and hard work cut off Allama Hakeem Ahmad Husain’s life in its prime; with the support of his sons, Hakeem Ahmad Usmani & Hakeem Muhammad Usmani, not only he kept the institution in existence but also expanded it. When the Unani Medical School was in at the stage of infancy , the constructions were in full swing and Hakeem Sahib was needed everywhere for his valuable advice and guidance , the providence had a different plan and that came into being in the form of the passing away of the Hakeem Sahib. Sadly Allama Hakeem Maulvi Ahmad Husain (d.1933) did not live long enough to see the flowering of his dream into the multidimensional college that it was to become in the competent hands of his illustrious son- Hakeem Ahmad Usmani.Allama Hakeem Ahmad Husain virtually gave a new life to Unani Tibb at a time when it had stagnated beyond belief. Today Unani Medical College with a wide portfolio is amongst the leading medical institutes in India. After spending an eventful, successful life Allama Hakim Ahmad Husain Allahabadi passed away on 3rd Shawwal, 30 January 1933 and was laid to rest inside the premises of Unani Medical College. A very meaningful urdu couplet is engraved on the eastern side of his grave. 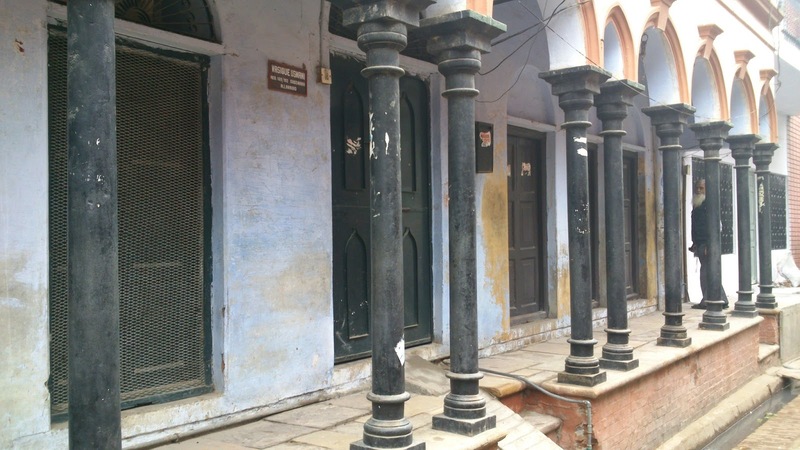 A road in Sabzi Mandi, Allahabad was named and called Hakeem Ahmad Husain Road. Allama Hakim Ahmad Husain Sahib was not only a Hakim but he was an Aalim of repute and among his multifold contributions to the field of literature were the 14 volumes of Tareekh Ibn Khaldun that he translated into Urdu in 1899 and to this date it is the only authentic version in the language. For his contribution, he won recognition throughout the literary world.Prior to this he had penned the life history of Salahuddin Yusuf and Seerat Noor-ud-Din Zangi in 1897,Jang’ha-i-Saleebi that proved him to be a prolific author of Islamic History. Allama Hakim Ahmad Husain established the Unani Dawakhana in 1912 at Subzi Mandi after his clientale increased manifold inlcuding the royal families seeking appointments, that disturbed the students at his clinic as well . Hindustani Dawakhana was started as a small Unani clinic in one of the by lanes of the Allahabad, Unani Dawakhana soon became synonymous with integrity and high quality in the field of relatively inexpensive Unani medicines. Thousands of patients got benefitted from the remedy provided from this dispensary. Members of the then princely states constituted a considerable chunk amongst his regular patients. Firstly Allama Hakeem Ahmad Husain himself sat in the Dawakhana thereafter his son Shifa-ul-Mulk Hakeem Ahmad Usmani who attracted patients no less than his father during his lifetime and thereafter Hakeem Hamd & Hakeem Humaid Usmani regularly sat there and kept the tradition alive. As of today one franchised practitioner is running the Dawakhana. You cannot visulaize the grandeur and hustle bustle of the Unani Dawakhana from what you see it today. You can guage the popularity and reliability that the Dawakahan and its medicines were advertised in journals like the “ The Modern Science “ I was going through some old files in the library at Delhi when I found the following advertisement in its issue of 1920. Tareekh Adab al Arab – translated by Dr. Ghayur Zubaid Ahmad published in 1926. Mathnavi-i-Shahr-i-Ashoob by Hakim Abdul Hameed was also printed here. A socio-literary magazine called “ Karnama “ was also ublished from the same press….It carried the progress report of the Medical College along with medical and literary articles.Karnama was edited by Masroor Qanauji, Safwan Usmani, Syed Abul Aliyy’Bahr’ Allahabadi, Munshi Balroop, Munshi Abdul Ghafoor Khan at different periods of time. The Magazine published from 1920 through 1960. Hakim Ahmad Husain was succeeded very capably by his two sons Hakim Ahmad Usmani And Hakeem Safwan Usmani. While Hakeem Ahmad Sahib assumed the post of secretary, Hakeem Safwan served as the principal of the Unan icollege. However the later years showed that Shif-ul-Mulk Hakeem Ahmad Usmani was the Meer-i-Karwan of this period. Hakeem Ahmad Usmani was born on 21 July 1896 at Makhaupur , a village in Pargana Chail, his nanihal. His initial education started at home under his father’s guidance. Later on he was admitted to Madarsa Ahya-ul-Uloom where he completed his Dars Nizami in 1909. He did his matriculation from Govt High School Allahabad in 1912. He later on did his graduation from Ewing Christian College in 1914. Thereafter he was enrolled in KGMC Lucknow but took part in the freedom movement and had to leave the college midway. He had already been taught by his father in the Unani Tibb and after returning from Lucknow he made Unani Medicine his prime concern. As he grew up, Hakeem Ahmad Usmani assumed all responsibilities. After helping in his younger brother's upbringing and education, his father included him in running the institution. Now both brothers Hakeem Ahmad Husain and Hakim Muhammad Usmani transformed a small school into a Medical College dedicated to the nation's health and education. After the partition of the country, the scenario changed drastically and fresh challenges had come up + plus the lack of local support posed challenges to him, but his dedication stiffened his resolve to overcome all difficulties. Using the talents with which he had been gifted, Hakim Ahmad Usmani raised Unani School from rented rooms and some rented furniture to the level of an Full fledged Medical College. His life was dedicated for the development of health, education, and similar nation building and philanthropic fields. The setting up a modern laboratory and subjecting the various drugs to laboratory tests brought the college on modern scientific lines for the first time.As a result not only did Unani College become a premier Medical School with a totally indigenous base, but it also emerged as mission committed to the service the society at large. He started his own practice in 1916 and was highly successful in his profession. He was offered the post of prinicipal of Govt Tibbiya College,Patna and had offers from Nizam Govt , Hyderabad as well but he did not accept those offers just for the sake of his father’s dream and the fact is if his father was the founder , then he was the real architect of this institution which was solely funded and managed by the Usmani family. Hakeem Ahmad Usmani took extensive tour throughout the country, tirelessly worked for the development and recognition of the institution, worded unrelentingly for the promotion & protection of Unani Tibb and the practitioners of Unani medicine. Everywhere in the country, he was held high in esteem. His profound knowledge on Unani-pathy and the Application of medicine gave him envious growth and at one time was the most sought after Hakeem of his time. In recognition of his services, The British Government decided to honour him. Lord Linlithgow (1936-43), the Governor-General and Viceroy of India conferred upon him the title “Shifa-ul-Mulk” in 1941. It was a strange fact that Hakim Sahib’s ancestors were punished and charged with sedition in 1857 while his grandson was awarded by the British Government after 90 years. He was a avid reader of books. Wrote wonderful articles for different journals, “FROG IN THE WELL” and “AVICENNA IN THE ATOMIC AGE” are two specimen of his depth of knowledge and command over the subject. When he had stabilized the Unani College well and it was going at the top, he had a great impulse and yearning of performing Hajj. Materializing the plan he proceeded for Haj in year 1962. On 24 May 1962, Shifa-ul-Mulk Ahmad Usmani fell down while hitting stones at SATANS (Shaitan) in Minah on 14th May 1962.He was shifted with head injuries to a hospital in MAKKAH the next day, but breathed his last on 25th May 1962, fulfilling his desire to remain there ,according to 22 Zil-Hijj 1381 AH and was laid to rest in Jannatul M’aala , Makkah Muazzamah. May Allah shower his blessings upon him Aameen ! He left behind the widow, a daughter and two sons, Hakeem Hammad Usmani & Hakeem Hamdan Usmani to carry forward the legacy. I reproduce below a letter of Pt.Jawaharlal Nehru addressed to his daughter Indira Gandhi , both former Prime-ministers of India with a mention of the late Hakeem Usmani. Hakeem Mohammd Ilyas Azami(Kot,Azamgarh),Hakeem SM Hanifa(Ceylon),Hakeem Muhammad Saleem (Orissa), Hakeem Abdul Nafey ( Bulandshahr), Hakeem Syed Muhammad Noor(Muzaffarpur),Hakeem Mazhar Subhan (Gorakhpur), Hakeem Abdul Razzaq Kashish Siddiqi(Karachi),Hakim Anwar( Nasik), Hakim Muhammad Abdullah Nadvi, Hakim Fayyaz Husain Husaini(Ghazipur),Hakeem Aale Hasan Masroor Qanauji(Kanauji) (Karachi),Hakeem Tayyab(Lucknow), Hakeem Abdul Raheem (Srinagar), Hakeem Muhammad Saeed( Banaras), Shah Muhammad Akhtar Sahib Partabgarhi (Pak),are few of the disciples of Shifa ul Mulk Hakeem Ahmad Usmani. Mention must be made of Hakeem Safwan Sahib, the genious of Usmani family who rose to shine for relatively a smaller period and left its marks on the horizon for long to reckon. Hakeem Safwan Usmani was born in 1902 at Kudapur (Saiyid Sarawan) Allahabad. After initial education at home, he was taken under the guidance by his father Hakeem Ahmad Husain who taught him medicine along with other religious sciences. 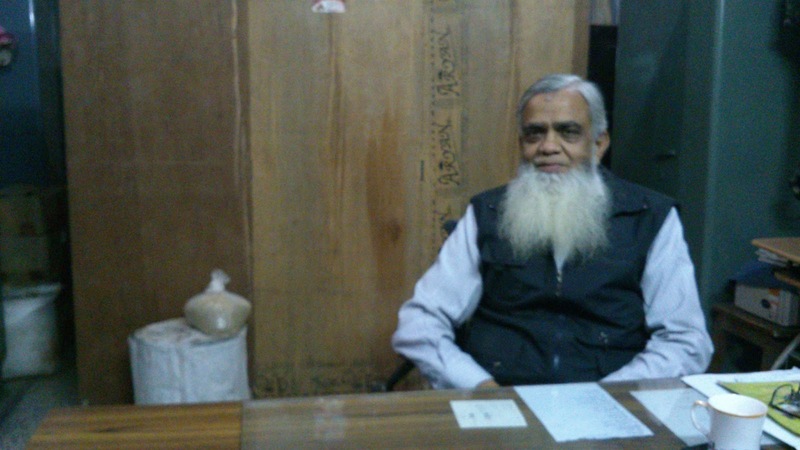 He graduated from Unani Medical School as Mahir-i-Tibb wal Jarahat and started his own clinic. He was a genius in all respects of discipline. While his elder brother Hakeem Ahmad Usmani took on the responsibility of Unani Medical School, Hakeem Safwan Sahib was interested in producing medicines and hence took care of Unani Dawakana alongwith the Unani Dawakhana Press where his father’s books were published originally. After two years of continuous ailment, Hakeem Safwan Usmani expired on 16, sept 1952 , leaving his elder brother alone to bear the huge responsibilities of the Unani College and its expansion. The next towering figure of this golden chain and probably the last Samurai was Hakeem Hammad Usmani who was the son of Hakeem Ahmad Usmani. He was born on 20 April 1928 at Subzi Mandi, Allahabad. After initial studies (learned Persian from Hakeem Shifa-us-Samad of Yahyapur) he completed Muatamid-ut-Tibb-Wal-Jarahat (MUMS) from Unani Medical College in 1945. Later on he went to Bengal and enrolled himself at the Bankura Sammilani Medical College ,Bankura (West Bengal) to learn modern medicine (Allopath). Later on got transferred to the Dacca Medical School (now a College) where he read for a four year course for Licentiate in Medical Faculty (LMF) in Allopathy. Consequently he got well versed in both the traditional and modern medical sciences and was picked up and appointed as the 2nd Doctor in the department of Jails in Dacca. In Allahabad, his father was not happy at his being busy far from where he was badly needed and his being getting inclined towards Allopath. 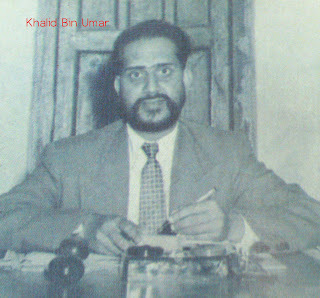 After a few exchange of letters, Hammad Usmani realized his father’s dreams and came back to Allahabad in 1950 to work whole heartedly for the cause of Unani Tibb and its expansion along with his father. 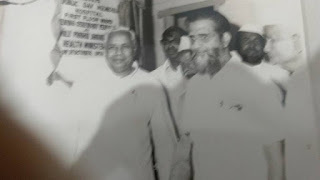 After the death of his uncle in 1952, he was permanently appointed as the Principal of the Unani Medical College, Allahabad, a post which he held till his retirement in 1988. He also served as an Honorary Project Officer in the Clinical Research Unit (Unani) at Allahabad till 1992. He had been the Dean, Faculty of Ayurvedic & Unani Medicine, Kanpur University, Kanpur. He served on the Scientific Advisory Committee of CCRUM of the Ministry of Health and Family Welfare, Govt. of India, was a member of Unani Pharmacopeia Committee of G.O.I. New Delhi and associated with various Govt. & Non-Govt. organizations working for Unani & Ayurvedic Medicine in India. He was a physician of exemplary excellence, His fame as the Nabbaz and Tabeeb travelled far & wide and was once the personal Unani Physician to the Governor of U.P. the (Late) Mohd. Usman Arif and was considered one of the most proficient & prominent Hakeem of our times. You may argue but for me he was the last samurai of the Unani Tibb in India…. He was a strict disciplinarian, a man of principles, was an strict administrator .He tirelessly worked for the consolidation of the Unani College till it was taken over by the UP Govt,was regularly consulted by the Central & State Government on issues related to the indigenous systems of medicine, was on board on various committees by the government, Sat in his clinic regularly ,listened to the problems of the patients. A veteran ROTARIAN ,looked after the affairs of Muslim Boarding House and that too ……not one or two years……..
Do Char baras ki Bat nahi ! Dr. Hammad Usmani, died on 30 Dec, 2000 at Allahabad leaving his eldest son Dr. Saad Usmani to look after what he had put his life for. IN his death, Allahabad lost one of the most respected of its citizens who was held in esteem by every section of Society and was hope to thousands of hopeless. Disciples – Amongst his disciples are Hakim Syed Mehdi Hasan ( Ajmer ), Hakim Ata-ur-Rahman Jafri( Allahabad),Hakim KA Shafqat Azmi (CCRUM, Delhi), Hakim Abu Bakr ( Malegaon), Hakim Shams-ul-Afaq Siddiqi (Delhi),Hakim Syed Fariduddin Zaidi (Pune),Hakim Anis-ur-Rahman (Burhanpur), Hakim Fariduddin, Hakim Uzair ,Hakim Abdul Salam(Lucknow) , Hakim Ram Krishna Arora ( Allahabad), Hakim Saad Usmani ( Son),Hakim Shakeel Azmi (Ghosi),Hakim Ahmad Yasin (Delhi) are few from the long list of his pupils……..
Tab Khaak ke parde se insaan nikalte hain ! ! (Dr(Prof)Saad Usmani – The last Hope! Eldest son of Hakim Hammad is (Prof) Dr. Saad Usmani who is himself a Unani Physician and retired in 2011 as the Principal of the State Unani Medical College Allahabad. Dr. Saad, a scion of Usmani family, is now 'serving' people with Unani medicine with same pride and dedication, what his ancestors have been doing for the generations ago. He is a profound scholar and has to his credit at least two dozen research papers on various topics and has attended at least six international conferences on Unani medicine. He is frequently invited to the Doordarshan and Akashvani as well. He is the president of the Rotary Club of Allahabad currently. He has also been honoured by Central Council of Research in Unani Medicine (CCRUM) and Central Council of Indian Medicine (CCIM) for his outstanding work in Unani medicine. Dr Saad Usmani is also actively involved with various literary, social and cultural organizations. In the photo on right Dr.Saad is seen felicitating Mr.Vikas Swaroop IFS, at present Counsul General of India at Osaka, Japan. Mr.Vikas Swaroop was being honoured for his novel Q & A, on which the film Slum Dog Millionaire has been made. This felicitation program was organised by Rotary International Alld. when Dr.Saad Usmani was its Secretary. Yasmanil Usmani - Dr.Saad’s younger Brother Yasmanil is into the manufacturing of herbal & unani medicines and has set up a factory at his ancestral place in Kudapur named as HERBODRUGS & PHARMACEUTICALS PVT LTD.
At one point of time, the entire generation of this family was involved in practicing Unani Tibb. Mentioned should be made of Hakeem Humaid Usmani, Hakeem Hamd Usmani and Hakeem Hamdun Usmani (The sons of Illustrious Hakeem Muhammad Safwan Usmani). Barf ki Tarah pighaltey to Samandar hotey ! Hakeem Hamd Usmani (10.07.1934 - 08.06.1992)– practiced medicine and was a teacher of Physiology in Unani College who died during his service. Hakeem Hamdan Usmani (01.07.1935 - 30.07.2004)– a qualified Hakeem, he did not or very little practice and when the govt took over the Unani College , he was RMO at the hospital but was absorbed as the medical officer in government service. let me share with you in brief that the family which founded,raised, supported and funded the entire college from their own funds and contributed so much for the common man has endured a lot in the process, intimidation, attempts on life, legal cases, oppositions, feud, animosity of their own people, apathy of the government etc etc but they stood their ground, exhausted their funds & blood to sustain and raise the Unani Medical College to further heights……In turn when the government took over the hospital in 1982, incredibly no compensation was paid or no recognition of the family was acknowledged. Today the family has almost lost its ties with the brain-child of Hakeem Ahmad Husain Allahabadi which their generations nourished with their blood & wealth.It is a towering tree now in the hands of others. Only the men with morals , with discipline could do, achieve and contribute in such a big way in life. Do we have something that we could share with our brothers in humanity ? Do we have anything to be handed over to the present generation to take care of ? My salute to these gems of Pargana Chail and thanks a lot Khalid Sahab for introducing us (The present genration )to such a Wirasat of Hakeem family which is still benefiting thousands(also a Sadqa e Jaaria ).